For other uses, see Paris attacks. Paris motto: Fluctuat nec mergitur. The November 2015 Paris attacks were a series of co-ordinated terrorist attacks that took place on 13 November 2015 in Paris, France and the city's northern suburb, Saint-Denis. Beginning at 21:16 CET, three suicide bombers struck outside the Stade de France in Saint-Denis, during a football match. This was followed by several mass shootings and a suicide bombing, at cafés and restaurants. Gunmen carried out another mass shooting and took hostages at an Eagles of Death Metal concert in the Bataclan theatre, leading to a stand-off with police. The attackers were shot or blew themselves up when police raided the theatre. The attackers killed 130 people, including 90 at the Bataclan theatre. Another 413 people were injured, almost 100 seriously. Seven of the attackers also died while the authorities continued to search for accomplices. The attacks were the deadliest in France since the Second World War, and the second deadliest in the European Union since the Madrid train bombings in 2004. France had been on high alert since the January 2015 attacks on Charlie Hebdo offices and a Jewish supermarket in Paris that killed 17 people and wounded 22, including civilians and police officers. The Islamic State of Iraq and the Levant (ISIL) claimed responsibility for the attacks, saying that it was retaliation for the French airstrikes on ISIL targets in Syria and Iraq. The President of France, François Hollande, said the attacks were an act of war by ISIL. The attacks were planned in Syria and organised by a terrorist cell based in Belgium. Most of the Paris attackers had French or Belgian citizenship, two were Iraqis, and some had fought in Syria. Some of them had entered Europe among the flow of migrants and refugees. In response to the attacks, a three-month state of emergency was declared across the country to help fight terrorism, which involved the banning of public demonstrations, and allowing the police to carry out searches without a warrant, put anyone under house arrest without trial and block websites that encouraged acts of terrorism. On 15 November, France launched the biggest airstrike of Opération Chammal, its contribution to the anti-ISIL bombing campaign, striking ISIL targets in Raqqa. On 18 November, the suspected lead operative of the attacks, Abdelhamid Abaaoud, was killed in a police raid in Saint-Denis, along with two others. France had been on high alert for terrorism since the Charlie Hebdo shooting and a series of related attacks in January by militants belonging to Al-Qaeda in the Arabian Peninsula, and had increased security in anticipation of the 2015 United Nations Climate Change Conference, scheduled to be held in Paris at the beginning of December, as well as reinstating border checks a week before the attacks. Throughout 2015, France witnessed smaller attacks: the February stabbing of three soldiers guarding a Jewish community centre in Nice, the June attempt to blow up a factory in Saint-Quentin Fallavier, and the August shooting and stabbing attack on a passenger train. The Bataclan theatre had been threatened a number of times because of its public support for Israel. Two Jewish brothers, Pascal and Joël Laloux, owned the Bataclan for more than 40 years before selling it in September 2015. In 2011, a group calling itself Army of Islam told French security services they had planned an attack on the Bataclan because its owners were Jewish. In the weeks leading up to the Paris attacks, ISIL and its branches had claimed responsibility for several other attacks: the downing of Metrojet Flight 9268 on 31 October and the suicide bombings in Beirut on 12 November. Intelligence agencies in Turkey, Iraq, and Israel had all warned of an imminent attack on France months beforehand, but were ignored by the French authorities. This was one of two terrorist cells sent to Europe by the Islamic State in 2015, the other cell consisting of three Syrians was apprehended by German special forces in Schleswig-Holstein in mid September 2016. 21:16[note 1] – First suicide bombing near the Stade de France. 21:19[note 1] – Second suicide bombing near the Stade de France. 21:25 – Shooting at the rue Bichat. 21:32 – Shooting at the rue de la Fontaine-au-Roi. 21:36 – Shooting at the rue de Charonne. 21:40 – Suicide bombing on boulevard Voltaire. 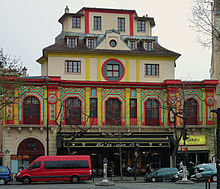 21:40 – Three men enter the Bataclan theatre and begin shooting. 21:53 – Third suicide bombing near the Stade de France. 22:00 – Hostages are taken at the Bataclan. 00:20 – Security forces enter the Bataclan. 00:58 – French police end the siege on the Bataclan. Three groups of men launched six distinct attacks: three suicide bombings in one attack, a fourth suicide bombing in another attack, and shootings at four locations in four separate attacks. Shootings were reported in the vicinity of the rue Alibert, the rue de la Fontaine-au-Roi, the rue de Charonne, the Bataclan theatre, and avenue de la République. Three explosions occurred near the Stade de France, another on boulevard Voltaire, and two of the Bataclan shooters also detonated their suicide vests as police ended the stand-off. According to the Paris prosecutor, the attackers wore suicide vests that used acetone peroxide as an explosive. Three explosions occurred near the country's national sports stadium, the Stade de France, in the suburb of Saint-Denis, resulting in four deaths, including the three suicide bombers. The explosions happened at 21:16, 21:19,[note 1] and 21:53. The first explosion near the stadium was about 20 minutes after the start of an international friendly football match between France and Germany, which President Hollande was attending. The first bomber was prevented from entering the stadium after a security guard patted him down and discovered the suicide vest; a few seconds after being turned away, he detonated the vest, killing himself and a bystander. Investigators later surmised that the first suicide bomber had planned to detonate his vest within the stadium, triggering the crowd's panicked exit onto the streets where two other bombers were lying in wait. Ten minutes after the first bombing, the second bomber blew himself up near the stadium. [note 1] Another 23 minutes after that, the third bomber's vest detonated nearby; according to some reports, that location was at a McDonald's restaurant; others state that the bomb detonated some distance away from any discernible target. Hollande was evacuated from the stadium at half-time, while the German foreign minister, Frank-Walter Steinmeier, remained at the stadium. Hollande met with his interior minister Bernard Cazeneuve to co-ordinate a response to the emergency. Two of the explosions were heard on the live televised broadcast of the match;[note 1] both football coaches were informed by French officials of a developing crisis, but players and fans were kept unaware of it until the game had finished. Hollande, concerned that the safety of the crowd outside the stadium could not be assured if the match was immediately cancelled, decided that the game should continue without a public announcement. Following the game, fans were brought onto the pitch to await evacuation as police monitored all the exits around the venue. Security sources said all three explosions were suicide bombings. The German national football team was advised not to return to their hotel, where there had been a bomb threat earlier in the day, and they spent the night in the stadium on mattresses, along with the French team, who stayed with them in a display of camaraderie. The first shootings occurred around 21:25 on the rue Bichat and the rue Alibert, near the Canal Saint-Martin in the 10th arrondissement. Attackers shot at people outside Le Carillon, a café and bar, before crossing the rue Bichat and shooting people inside the restaurant Le Petit Cambodge. According to French police, an eyewitness said one of the gunmen shouted "Allahu Akbar". Le Monde reported that 15 people were killed at these locations and 10 were critically injured. The assailants fled in one or two vehicles after the shootings. One vehicle had a Belgian number plate. Doctors and nurses from the nearby Hôpital Saint-Louis were in Le Carillon when the attacks happened and supplied emergency assistance to the wounded. At 21:32, a man with a Kalashnikov rifle fired shots outside Café Bonne Bière, close to the terrace of the Italian restaurant La Casa Nostra, on the rue de la Fontaine-au-Roi where it intersects with the rue du Faubourg-du-Temple south of the rue Bichat. The Paris prosecutor said five people were killed and eight were injured. An eyewitness reported a gunman firing short bursts. At approximately 21:36, two gunmen fired shots for several minutes at the outdoor terrace of the restaurant La Belle Équipe on the rue de Charonne in the 11th arrondissement where it intersects the rue Faidherbe, before returning to their car and driving away. Nineteen people were killed, and nine were left in critical condition. At about 21:40, on the boulevard Voltaire in the 11th arrondissement, near the place de la Nation, a man sat down in the Comptoir Voltaire café and placed an order before detonating his suicide vest, killing himself and injuring fifteen people, one of them seriously. At approximately 21:40, a mass shooting and hostage-taking occurred at the Bataclan theatre on the boulevard Voltaire in the 11th arrondissement. The American band Eagles of Death Metal was playing to an audience of around 1,500 people. About an hour into the concert, a car pulled up outside the venue and three dark-clad men with AKM assault rifles entered the hall. The gunmen were three French natives: Foued Mohamed-Aggad, 23 years old, Ismaël Omar Mostefaï, 29 years old, and Samy Amimour, 28 years old. As the band began playing their song "Kiss the Devil", witnesses heard shouts of "Allahu Akbar" just before the gunmen opened fire on the crowd. Initially, the audience mistook the gunfire for pyrotechnics. The attack lasted 20 minutes, until one of the terrorists got shot by the police. A radio reporter attending the concert described the attackers as calm and determined, and that they reloaded three or four times. Survivors escaped via the emergency exit into the street or made their way onto the roof, with some taking refuge in toilets and offices; others lay still on the floor pretending to be dead. According to surviving eyewitnesses, the terrorists walked among those who were lying down, kicked them and shot them in the head if there was any sign of life. They reloaded their weapons several times and laughed while shooting at people who tried to run for the exit while they were reloading. The band's members escaped without injury. At around 22:00, after Amimour got shot by the first responders and detonated his explosive vest, the remaining attackers took 12 concertgoers hostage as police gathered outside the venue. They threatened to decapitate a hostage and throw the corpse out of the window every five minutes. A witness who escaped told a journalist that the gunmen had mentioned Syria. One witness in the Bataclan heard a gunman say, "This is because of all the harm done by Hollande to Muslims all over the world." There were further attacks on police and first responders who arrived at the scene. Starting at 22:15, the Brigade of Research and Intervention (BRI) arrived on the scene, followed by the elite tactical unit, RAID. The assault on the theatre began at 00:20 and lasted three minutes. Police launched the assault because of reports that the attackers had started killing hostages. They initially estimated that 100 people had been killed, but the toll was revised to 89, and finally 90. Two attackers died by detonating their suicide vests. Another was hit by police gunfire and his vest blew up when he fell. Identification and removal of the bodies took 10 hours, a process made difficult because some audience members had left their identity papers in the theatre's cloakroom. Three groups, comprising three men each, executed the attacks. They wore explosive vests and belts with identical detonators. Seven perpetrators died at the scenes of their attacks. The other two were killed five days later during the Saint-Denis police raid. On 14 November, ISIL claimed responsibility for the attacks. François Hollande said ISIL organised the attacks with help from inside France. Claimed motives were an ideological objection to Paris as a capital of abomination and perversion, retaliation for airstrikes on ISIL in Syria and Iraq, and the foreign policy of Hollande in relation to Muslims worldwide. Shortly after the attacks, ISIL's media organ, the Al-Hayat Media Group, launched a website on the dark web extolling the organisation and recommending the encrypted instant messaging service Telegram. Fabien Clain released an audio recording the day before the attacks in which he personally claimed responsibility for the attacks. Clain is known to intelligence services as a veteran jihadist belonging to ISIL, and of French nationality. Syrian and Egyptian passports were found near the bodies of two of the perpetrators at two attack sites, but Egyptian authorities said the passport belonged to a victim, Aleed Abdel-Razzak, and not one of the perpetrators. By 16 November, the focus of the French and Belgian investigation turned to Abdelhamid Abaaoud, the radical jihadist they believed was the leader of the plot. Abaaoud had escaped to Syria after having been suspected in other plots in Belgium and France, including the thwarted 2015 Thalys train attack. Abaaoud had recruited an extensive network of accomplices, including two brothers, Brahim Abdeslam and Salah Abdeslam, to execute terrorist attacks; Abaaoud was killed in the Saint-Denis raid on 18 November. Most of the Paris attackers were French and Belgian citizens who crossed borders without difficulty, albeit registered as terrorism suspects. Two other attackers were Iraqi. According to the French prime minister, Manuel Valls, several of the perpetrators had exploited Europe's immigration crisis to enter the continent undetected. At least some, including the alleged leader Abdelhamid Abaaoud, had visited Syria and returned radicalised. Jean-Charles Brisard, a French expert on terrorism, called this a change of paradigm, in that returning European citizens were themselves the attackers. The Los Angeles Times reported that more than 3,000 Europeans have travelled to Syria and joined ISIL and other radical groups. On 30 August 2016, jihadist Abu Mohammad al-Adnani was killed by an American missile and DGSI declared that his death ended the terrorist who had supervised the attacks on Brussels and Paris. A grey Volkswagen Polo with Belgian licence plates abandoned near the Bataclan was hired by a French citizen living in Belgium and contained a parking ticket from the town of Molenbeek. A SEAT was found in the Paris suburb of Montreuil on 15 November and contained assault rifles. A Renault Clio hired by Salah Abdeslam was discovered near Montmartre on 11 November and contained assault rifles. Police described Salah, a 26-year-old Belgian citizen, as dangerous, and warned the public not to approach him. He was arrested on 18 March 2016 during an anti-terrorist raid in the Molenbeek area of Brussels (see below). His brother, Brahim, died in the attacks. Another brother, Mohamed, was detained on 14 November in the Molenbeek area of Brussels and released after several hours of questioning. Mohamed said he did not suspect his siblings of planning anything. On 14 November, a car was stopped at the Belgium–France border and its three occupants were questioned then released. Three more people were arrested in Molenbeek. Links to the attacks were investigated in an arrest in Germany on 5 November, when police stopped a 51-year-old man from Montenegro and found automatic handguns, hand grenades and explosives in his car. On 15–16 November, French tactical police units raided over 200 locations in France, arresting 23 people and seizing weapons. Another 104 people were placed under house arrest. On 17 November, police followed a female cousin of the attacker and ringleader, Abdelhamid Abaaoud, to a block of flats in Saint-Denis where they saw Abaaoud with her. The next day, police raided a flat in Saint-Denis, and Abaaoud was killed in the ensuing gunfight, which lasted several hours. Chakib Akrouh, one of the perpetrators of the restaurant shootings, also died during the raid after detonating an explosive vest. Eight suspected militants were arrested at or near the flat. On 23 November, an explosive belt was found in a litter bin in the Paris suburb of Montrouge. It may have been discarded by Salah Abdeslam, whose phone records showed that he was in Montrouge on the night of the attacks. On 24 November, five people in Belgium had been charged on suspicion of their involvement in the Paris attacks, and Belgian prosecutors issued an arrest warrant for Mohamed Abrini, a 30-year-old suspected accomplice of Salah Abdeslam. Abrini was subsequently reported to have been arrested on 8 April 2016. He is also suspected of having been involved in the 2016 Brussels bombings. On 9 December, two ISIL militants accompanying two of the Paris attackers into Europe, all masquerading as migrants, were arrested in Greece weeks before the attacks. In July 2016, a third militant involved was also arrested despite regular activity on Facebook from Belgium. The three militants were part of a unit intended to carry out further attacks on 13 November, but their plans were apparently disrupted by the first two arrests. Fabien Clain was identified as the person reading the ISIL claim of responsibility. Clain is a French national who served 5 years from 2009 to 2014 in a French prison for recruiting fighters to go to Syria for jihad. Clain has been linked to other executed and planned terror attacks and is seen as a leader of known terrorists. Jawad Bendaoud was arrested 18 November 2015 for "criminal criminal terrorist association for the purpose of committing violent action", as he provided lodging for Abaaoud, Hasna Aït Boulahcen, and a third man. In September 2017, the prosecuting judge filed for Bendaoud's trial for "concealment of terrorist criminals", a charge with a maximum penalty of six years. Michael Leiter, former director of the United States National Counterterrorism Center, said the attacks demonstrated a sophistication not seen in a city attack since the 2008 Mumbai attacks and that it would change how the West regards the threat. Further comparisons were made between the Paris attacks and the Mumbai attacks. Mumbai Police Joint Commissioner (Law and Order) Deven Bharti pointed out the similarities as having several targets, shooting indiscriminately, and the use of improvised explosive devices. According to Bharti, one key difference was that the Mumbai attacks lasted several days, and the Paris attackers killed themselves as soon as capture seemed imminent. Evidence points to the attackers having regularly used unencrypted communications during the planning of the attack. The attackers killed 130 victims and injured between 352 and 368, with 80 to 99 taken to hospital in serious condition. Hours before the attacks, Paris's doctors had practiced a mass shooting emergency response rehearsal. Of the dead, 89 died at the Bataclan theatre, 19 at La Belle Équipe, 15 at Le Carillon and Le Petit Cambodge, 5 at Café Bonne Bière and La Casa Nostra, and 1 at Stade de France. Among those who died at the Bataclan were a music critic of Les Inrockuptibles, an executive of Mercury Records France, and the merchandise manager of Eagles of Death Metal, the band that was performing. Some people suffered from posttraumatic stress disorder (PTSD). The hashtag #portesouvertes ("open doors") was used by Parisians to offer shelter to those afraid to travel home after the attacks. As had been the case in January after the Charlie Hebdo attacks, the Place de la République became a focal point of mourning, memorial, and tributes. An impromptu memorial also developed near the Bataclan theatre. On 15 November, two days after the attacks, a memorial service was held at Notre Dame Cathedral, presided over by the Archbishop of Paris, Cardinal André Vingt-Trois, with several political and religious figures in attendance. Muslim organisations in France, such as the Union of Islamic Organisations of France, strongly condemned the attacks in Paris. The attacks affected business at high-profile venues and shopping centres in Paris, and many Parisians were concerned the attacks might lead to a marginalisation of Muslims in the city. There was not the same call for solidarity with Islam, as in January, following the attacks. Sales of the French flag, which the French had rarely displayed prior to the attacks, increased dramatically after the attacks. On 4 December, the Bonne Bière café reopened, adorned by a banner with the defiant slogan "Je suis en terrasse" ("I'm on the Terrace"). A street cleaner told France 24 that the city had removed six truckloads of wilted flowers and several kilograms of candles from memorials placed around this and the other shooting scenes: "We didn't really want to get rid of things, but it feels a bit like a cemetery with all the flowers." President Hollande issued a statement asking the French people to remain strong in the face of the attacks. He also visited the Bataclan theatre and vowed to "mercilessly" fight against terrorism. Hollande chaired an emergency meeting of the French Cabinet that night and directed his national security council to meet the next morning. The authorities urged the residents of Paris to stay indoors for their own safety and declared a state of emergency. Hollande cancelled his trip to the 2015 G-20 Antalya summit because of the attacks, instead sending Foreign Minister Laurent Fabius and Finance Minister Michel Sapin as his representatives. On 14 November, Hollande announced three days of national mourning. On 17 November, Hollande convened a special Congress of the French Parliament to address the attack and lay out legislative and diplomatic plans he wanted to take in response to them. These proposals included an extension of the state of emergency for three months, changes to the French constitution, one of which would enable France to protect itself from dual citizens who might pose a risk, and an increase in military attacks against ISIL. On 4 December 2015, the French government published a guide in form of a cartoon on how to survive a terrorist attack. The guide is to be posted in public places and be available online. In August 2016 minister of the interior Bernard Cazeneuve stated that about 20 radicalised mosques and further than some 80 hate preachers had been expelled from France since 2012. On 15 November, the French Air Force launched the biggest airstrike of Opération Chammal, its bombing campaign against ISIL, sending 10 aircraft to drop 20 bombs on Raqqa, the city where ISIL is based. On 16 November, the French Air Force carried out more airstrikes on ISIL targets in Raqqa, including a command centre and a training camp. On 18 November 2015, French aircraft carrier Charles de Gaulle left its home port of Toulon heading towards the eastern Mediterranean to support bombing operations carried out by the international coalition. This decision was taken before the November attacks but was accelerated by the events. French authorities regularly gave detailed information to US authorities on the whereabouts of high-ranking IS members in the Syria-Iraq zone to be tracked and killed. This cooperation was led to American air strinkes being able to kill the planners of the 13 November 2015 attacks. United States authorities cooperate as they consider that if terrorist attacks hadn't happened in France, they would have happened in the US instead. Applications to join the French Army, which were around 100–150 per day in 2014, rose to 1,500 in the week following the attacks, higher than the rise to 400 after the Charlie Hebdo shooting in January. All major political parties, including Hollande's governing Socialist Party, Marine Le Pen's National Front, and Nicolas Sarkozy's Republicans temporarily suspended their election campaigns for the upcoming French regional elections. There was a nationwide minute of silence at noon which President Hollande and several ministers observed at a ceremony at the Paris Sorbonne University. On 18 November, Hollande reaffirmed France's commitment to accept 30,000 Syrian refugees over the next two years. This was despite the doubts that the terror attack had sown in people's minds. His announcement drew a standing ovation from a gathering of French mayors. However, in the election campaign for the regional elections of France, to begin on 6 December 2015, Marine Le Pen, leader of the far-right Front National party who is vying to be president of the Nord-Pas de Calais area, was recommending hardline security measures. She was getting a great deal of media attention with her strong anti-immigrant stance and may have been helping to sway public opinion across France. "The influx of migrants must be stopped," Le Pen told the CBC in an interview. Le Pen was doing well in opinion polls as of early December 2015. Since the elections would start only weeks after the Paris attacks, she was thought to be getting dividends from the timing, when the fear of terrorism was still very strong. Jean-Claude Juncker, President of the European Commission, rejected calls to rethink the European Union's policy on migration. Dismissing suggestions that open borders led to the attacks, Juncker said he believed that the attacks should be met with a stronger display of liberal values, including internal open borders. European Commission Vice-President Federica Mogherini and EU defence ministers unanimously backed France's request for help in military missions. The United Kingdom has stated its intent to help France with operations in Syria, while some countries intend to aid France by taking over activities in Africa. Germany announced sending troops to Mali and military trainers to Kurdish forces in Iraq, and has on 4 December voted in favour of deploying aircraft and a frigate in an effort to aid the French forces over Syria. The attacks prompted European officials to re-evaluate their stance on EU policy toward migrants, especially in light of the ongoing European migrant crisis. Many German officials believed a higher level of scrutiny was needed, and criticised German Chancellor Angela Merkel, while the German Vice-Chancellor Sigmar Gabriel defended her. French Interior Minister Bernard Cazeneuve said that he would meet with EU ministers to discuss how to deal with terrorism across the European Union. Meeting reports indicated that Schengen area border controls have been tightened for EU citizens entering or leaving, with passport checks and systematic screening against biometric databases. Poland's European affairs minister designate Konrad Szymański declared that he saw no possibility of enacting the recent EU refugee relocation scheme. The new Prime Minister of Poland, Beata Szydlo said she would ask the EU to change its decision on refugee quotas. Szydlo said Poland would honour the commitment made by the previous government to accommodate 9,000 refugees. Hungary's prime minister, Viktor Orbán, rejected the concept of mandatory resettlement quotas. Czech Prime Minister, Bohuslav Sobotka, criticised president Miloš Zeman for supporting anti-Islamic groups and spreading hatred, according to Reuters, whose report adds that the Sobotka government has been deporting migrants. Shortly after the attacks, intelligence staff in multiple countries began to review electronic surveillance recorded before the attacks. Adam Schiff, the ranking Democratic member of the United States House Permanent Select Committee on Intelligence, said he did not know of any intercepted communications that would have provided warning of the attacks. One source said the French National Police met with German police and intelligence services a month before the attack to discuss suspicions that terrorists were staking out possible targets in France. The exact targets were not known at that time. Police in Germany stopped a car on 5 November, arrested its driver, and confiscated weapons that may have been connected to the Paris attacks. Some of the attackers were known to law enforcement officials prior to the attacks, and at least some of the attackers had residences in the Molenbeek area of Brussels, which is noted for its links to extremist activities. A counter-terrorism expert said the fact that the perpetrators were known to authorities suggests that intelligence was "pretty good" but the ability to act on it was lacking. The number of Europeans who have links to Syria makes it difficult for security services to keep track of them all. On 26 December 2015, "Belgian newspaper De Morgen reported that a police oversight body, known as Committee P," is investigating why prior warnings from a school about the radicalisation of one of the attackers, Bilal Hadfi, were not reported to Belgian law enforcement. In response to the attacks, France was put under an état d'urgence (state of emergency) for the first time since the 2005 riots, borders were temporarily closed, and 1,500 soldiers were called in to help the police maintain order in Paris. The plan blanc (Île de France) and plan rouge (global), two contingency plans for times of emergency, were immediately activated. Flights to and from Charles de Gaulle Airport and Orly Airport were mostly unaffected. American Airlines delayed flights to Paris until further notice. Many Paris Métro stations in the 10th and 11th arrondissements were shut down because of the attacks. Uber suspended car hails in Paris after the attacks. All state schools and universities in Paris remained closed the next day. Sports events in France for the weekend of 14–15 November were postponed or cancelled. Disneyland Paris, which had operated every day since opening in 1992, closed its parks as a mark of respect for those who died in the attacks. The Eiffel Tower, a Paris landmark visited by 20,000 people a day, was closed for two days. Other venues that were to remain closed included shops and cinemas. Protests were banned until 19 November, while bands such as U2, Foo Fighters, Motörhead, and Coldplay cancelled performances in Paris. The week after 20 November, Hollande was planning to travel to the US and Russia to discuss greater international co-operation against ISIL. On 13 November, President Hollande declared the state of emergency. On 20 November, the Senate in France agreed to extend the current state of emergency by three months; this measure gave police extra powers of detention and arrest intended to increase security, at the expense of some personal liberties. (For effects, see also: 2016 Nice attack#Raids and house arrests under state of emergency.) Some demonstrations of environmental activists during COP21, held in Paris from 30 November to 12 December 2015, were prevented from happening under the state of emergency regulations, while others were allowed. A next time, the state of emergency was extended until the end of July 2016. Further extensions followed after the attack in Nice on 14 July 2016. Belgium immediately on 13 November tightened security along its border with France and increased security checks for people arriving from France. Starting on 21 November 2015, the government of Belgium imposed a security lockdown on Brussels, including the closure of shops, schools, public transportation, due to information about potential terrorist attacks in the wake of the series of coordinated attacks in Paris. One of the perpetrators of the attack, Belgian-born French national Salah Abdeslam, was thought to be hiding in the city. As a result of warnings of a serious and imminent threat, the terror alert level was raised to the highest level (four) across the Brussels metropolitan area, and people were advised not to congregate publicly, effectively putting the city under lockdown. 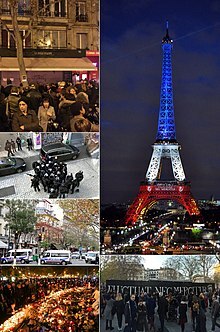 Cities in the United States took security precautions, especially at sites where large crowds were expected, as well as sports events, concerts, the French embassy and other French government sites. William J. Bratton, the New York City Police Commissioner, said the Paris attacks have changed the way law enforcement deals with security. Singapore raised its national security alert level, stepping up border checks and security across the city-state. Police and military authorities in Manila were placed on full alert in preparation for the APEC Economic Leaders' Meeting. Many heads of state and heads of government, as well as the United Nations, offered messages of condolence and solidarity in the wake of the attacks. The U.S. House of Representatives has passed a bill that made it more difficult for Syrian and Iraqi refugees to enter the United States. At least 31 governors of U.S. states declared they would refuse to accept Syrian refugees. Muslim heads of state, scholars, imams, leaders and groups condemned the attacks, many before ISIL claimed responsibility. These included the imam who heads the University of Al-Azhar in Egypt; the Supreme council of Religious Scholars in Saudi Arabia; Iranian president Hassan Rouhani and the Ahmadiyya caliph Mirza Masroor Ahmad. Syrian president Bashar al-Assad condemned the attacks, but added that France's support for Syrian rebel groups had contributed to the spread of terrorism. France had been a particularly vocal opponent of Assad during the Syrian civil war. Ahrar ash-Sham and Jaysh al-Islam, the major mainstream Islamist rebels against the Syrian regime, both condemned the attacks. Sayyed Hassan Nasrallah, the leader of Hezbollah, condemned the attacks, and expressed his solidarity with the French people. Other militant groups also condemned the attacks, including Hamas and Islamic Jihad Movement in Palestine. The al-Nusra Front, the Syrian branch of Al-Qaeda, praised the attacks, saying that even though they viewed ISIL as "dogs of hellfire," they applauded when "infidels" get attacked by ISIL. A few days after the attacks, on 17 November, a football friendly set to be played at HDI-Arena in Hannover between Germany (who had just been present at the Stade de France during the Paris attacks) and the Netherlands was cancelled and thousands of football fans evacuated from the arena following a bomb threat. The match, having been hailed as a "symbol of freedom" after the Paris attacks, was set to be attended in a show of solidarity with France by German chancellor Angela Merkel, vice-chancellor Sigmar Gabriel, several other German government ministers, as well as Dutch defence minister Jeanine Hennis-Plasschaert and health and sport minister Edith Schippers. According to a French intelligence dossier, five bombings had been prepared to be detonated at or around the stadium by a named five-member terror cell in a series of coordinated bomb attacks. German authorities refused to give more details on findings, with Interior Minister Thomas de Maiziere claiming that "some of these answers would alarm the public." While police claimed to not have found any explosives, German newspapers published allegations of a cover-up, which claimed that a paramedic had witnessed explosives hidden in an ambulance at the stadium, before being told by special forces at the scene "to not talk about it." Another newspaper claimed it had been a truck bomb disguised as an ambulance. Three police officers were disciplined for leaking information about alleged bomb finds. At the same time also in Hannover, the TUI Arena was evacuated before a concert by the band Soehne Mannheims, and a train station was closed off after a suspicious device was found. Later the same evening, two Air France flights headed from the United States to Paris were diverted because of bomb threats. The events followed the previous day, when a football match set to be played in Brussels between Belgium and Spain had also been cancelled over security concerns. On 15 March 2016, Belgian police carried out a raid on a house in the suburb of Forest in Brussels. A police statement said that the raid was related to the Paris attacks. Four police officers were wounded in the raid, and a manhunt for escaped suspects followed. On 18 March 2016, there were further raids in the Molenbeek area of Brussels. Two suspects were reportedly injured in one such raid and a third suspect was killed. Five people, one identified as Salah Abdeslam, suspected accomplice in the Paris attacks, were arrested during the raid. ^ a b c d e These times were officially given at a press conference by the prosecutor of Paris François Molins on 14 November 2015. However, video recordings of the match suggest that the gap between the first and the second explosion was much shorter because the first explosion is heard at 16:24 after the start of the match, and the second time at 19:34. ^ "Following the Path of the Paris Terror Weapons". Spiegel.de. 24 March 2016. Retrieved 27 November 2018. ^ "Paris attacks: More than 100 killed in gunfire and blasts, French media say". CNN. 14 November 2015. Retrieved 14 November 2015. ^ a b c "Paris attacks death toll rises to 130". RTE News. 20 November 2015. Retrieved 21 November 2015. ^ a b c Claire Phipps (15 November 2015). "Paris attacker named as Ismaïl Omar Mostefai as investigation continues – live updates". The Guardian. Retrieved 15 November 2015. ^ a b "Bataclan survivor describes moment Isis gunman tried to kill her". 12 November 2016. ^ a b c "Search goes on for missing". BBC News. 16 November 2015. Retrieved 17 November 2015. ^ a b c "Paris attacks: Everything we know on Wednesday evening". The Telegraph. 18 November 2015. Retrieved 19 November 2015. ^ a b "ISIS claims responsibility of Paris attacks". CNN. Retrieved 14 November 2015. ^ a b "L'organisation État islamique revendique les attentats de Paris" (in French). France 24. 14 November 2015. Archived from the original on 14 November 2015. Retrieved 14 November 2015. ^ a b c Elgot, Jessica; Phipps, Claire; Bucks, Jonathan (14 November 2015). "Paris attacks: Islamic State says killings were response to Syria strikes". The Guardian. Retrieved 14 November 2015. The group says the killings were in response to airstrikes against its militants in Syria, adding France would remain a "key target". ^ a b Dalton, Matthew; Varela, Thomas; Landauro, Inti (14 November 2015). "Paris Attacks Were an 'Act of War' by Islamic State, French President François Hollande Says". The Wall Street Journal. Retrieved 14 November 2015. Islamic State claimed responsibility for the attacks on a social media account, but didn't provide specific information that would allow the claim to be verified. It said that the attacks were retaliation for French airstrikes against the group in Syria and Iraq. ^ Jason Chow; Nick Kostov (27 November 2015). "France honors victims of Paris terrorist attacks". The Wall Street Journal. Retrieved 21 January 2016. ^ a b c d e f g h i j de la Hamaide, Sybille (14 November 2015). "Timeline of Paris attacks according to public prosecutor". Reuters. Retrieved 15 November 2015. ^ a b "Paris attacks: What we know so far". France 24. 15 November 2015. Retrieved 17 November 2015. ^ a b "What happened at the Bataclan?". BBC News. Retrieved 27 November 2018. ^ a b "This Is What Happened at the Bataclan Concert Hall During the Paris Attacks". News.vice.com. Retrieved 27 November 2018. ^ a b M. Marcus (19 November 2015). "Injuries from Paris attacks will take long to heal". CBS. Retrieved 20 November 2015. ^ "Parisians throw open doors in wake of attacks, but Muslims fear repercussions". The Guardian. 14 November 2015. Retrieved 19 November 2015. ^ Syeed, Nafeesa (15 November 2015). "Yes, Parisians are traumatised, but the spirit of resistance still lingers". The Irish Independent. Retrieved 19 November 2015. ^ "Europe's open-border policy may become latest victim of terrorism". The Irish Times. 19 November 2015. Retrieved 19 November 2015. ^ a b c d e f g h i j k Randolph, Eric & Simon Valmary (13 November 2015). "More than 120 people killed in Paris 'terror' attacks". Yahoo! News. Agence France-Presse. Archived from the original on 14 November 2015. Retrieved 14 November 2015. ^ "Paris attacks: Hollande blames Islamic State for 'act of war'". BBC News. 14 November 2015. Retrieved 14 November 2015. ^ a b c Nossiter, Adam; Breeden, Aurelien; Bennhold, Katrin (14 November 2015). "Three Teams of Coordinated Attackers Carried Out Assault on Paris, Officials Say; Hollande Blames ISIS". The New York Times. Retrieved 14 November 2015. ^ a b "Hollande says Paris attacks 'an act of war' by Islamic State". Thomson Reuters Foundation. 14 November 2015. Retrieved 14 November 2015. ^ a b c d Alicia Parlapiano; Wilson Andrews; Haeyoun Park; Larry Buchanan (17 November 2015). "Finding the Links Among the Paris Attackers". The New York Times. Retrieved 17 November 2015. ^ a b "Paris attacks: Who were the attackers?". BBC News. 13 November 2016. Retrieved 27 April 2016. ^ a b Traynor, Ian (20 November 2015). "EU ministers order tighter border checks in response to Paris attacks". The Guardian. London. Retrieved 20 November 2015. ^ "Movements of Isis extremist prior to Paris attack raise EU security questions". The Guardian. 19 November 2015. Retrieved 22 March 2016. ^ a b "Paris attacks: EU in emergency talks on border crackdown". The Guardian. 20 November 2015. Retrieved 22 November 2015. The French prime minister, Manuel Valls, said some of the killers had taken advantage of Europe's migrant crisis to "slip in" unnoticed. ^ a b c McDonnell, Patrick J; Zavis, Alexandra (19 November 2015). "Suspected Paris attack mastermind's Europe ties facilitated travel from Syria". Los Angeles Times, in the Sacramento Bee. Los Angeles, USA. Retrieved 20 November 2015. As waves of refugees from Syria converged on Europe this summer, law enforcement authorities feared this scenario: That terrorist operatives would slip in among the multitudes [...] Last week's attacks on France may have validated some of those fears. At least three of the seven known attackers and the suspected ringleader, Abdelhamid Abaaoud [...] are thought to have crossed clandestinely from Syria into Europe. ^ Andrew Griffin (19 November 2015). "France state of emergency declared for three months, allowing authorities to shut down websites and giving police sweeping new powers". The Independent. Retrieved 21 January 2016. ^ Rubin, Alissa. "France Strikes ISIS Targets in Syria in Retaliation for Attacks". The New York Times. Retrieved 16 November 2015. ^ Aurelien Breeden; Kimiko de Freytas-Tamura (19 November 2015). "Chief Suspect in Paris Attacks Died in Raid, France Says". The New York Times. Retrieved 19 November 2015. ^ "French soldiers wounded in Nice Jewish centre attack". BBC News. 3 February 2015. Retrieved 14 November 2015. ^ Walker, Peter; Malik, Shiv (26 June 2015). "France launches terror inquiry after decapitated body found in factory attack". The Guardian. Retrieved 14 November 2015. ^ Chrisafis, Angelique (22 August 2015). "France train attack: Americans overpower gunman on Paris express". The Guardian. Paris, France. Retrieved 14 November 2015. ^ a b Greenhouse, Emily (15 November 2015). "Life and Death on the Boulevard Voltaire". The New Republic. Retrieved 17 November 2015. ^ "Concert venue has history of anti-Semitic attacks". International Business Times. 14 November 2015. Retrieved 15 November 2015. ^ "History of le Bataclan". Bataclan. Archived from the original on 14 July 2015. Retrieved 15 November 2015. ^ Dan Bilefsky (14 November 2015). "Paris Theater Had Been Owned by a Jewish Family". The New York Times. Retrieved 14 November 2015. ^ "Pourquoi le Bataclan est-il régulièrement visé?". Le Point. Retrieved 14 November 2015. ^ "French mag: Bataclan an Islamist target due to Jewish owners". The Times of Israel. Retrieved 14 November 2015. ^ "Fransk magasin: Bataclan har jødiske eiere". Aftenposten. Retrieved 14 November 2015. ^ "Updates: Russian airliner crashes in Egypt's Sinai peninsula". BBC News. Retrieved 31 October 2015. ^ "Russian plane that crashed in Egypt 'broke up in air'". France 24 News. Retrieved 2 November 2015. ^ Barnard, Anne; Saad, Hwaida (12 November 2015). "ISIS Claims Responsibility for Blasts That Killed Dozens in Beirut". The New York Times. Retrieved 12 November 2015. ^ "ISIS claims responsibility for Beirut southern suburb attack". The Daily Star. Lebanon. 13 November 2015. Retrieved 13 November 2015. ^ "French Jews Warned Friday Morning of 'Impending Large Terrorist Attack'". News From Antiwar.com. 15 November 2015. ^ "Turkey warned France over key Paris terrorist suspect, official says". Daily Sabah. 16 November 2015. ^ "Turkey Says It Warned France Twice About Paris Attacker". The Huffington Post. 16 November 2015. ^ "Turkey Warned French Twice About Attacker, Official Says". The New York Times. 16 November 2015. ^ "Before Paris Terror Attacks, Turkey Warned France About Omar Ismaïl Mostefai, Requests Not Received Until After Bombing". International Business Times. 16 November 2015. ^ NDR. "Mehrjährige Haftstrafen im IS-Prozess" (in German). Retrieved 9 September 2018. ^ a b "Hollande : "Un acte de guerre commis par une armée terroriste"". Le Figaro. Retrieved 14 November 2015. ^ a b Nossiter, Adam; Breeden, Aurelien; Bennhold, Katrin (14 November 2015). "Three Teams of Coordinated Attackers Carried Out Assault on Paris, Officials Say; Hollande Blames ISIS". The New York Times. Retrieved 15 November 2015. ^ "EN DIRECT. Fusillades à Paris : assaut terminé au Bataclan". Le Point (in French). Retrieved 14 November 2015. ^ Ing, Nancy; Fieldstadt, Elisha (13 November 2015). "Dozens Dead, Hostages Held in Multiple Paris Attacks". NBC News. Associated Press. Retrieved 19 November 2015. ^ Shapiro, Emily (13 November 2015). "Several Dead After Explosions and Shootings in Paris". ABC News. Retrieved 13 November 2015. ^ a b Goldstein, Sasha (13 November 2015). "At least 26 dead after explosion, shooting reported in Paris". Daily News. New York. Retrieved 13 November 2015. ^ "Paris Terror Attacks". heavy.com. Retrieved 14 November 2015. ^ "As It Happened". thelocal.fr. Retrieved 14 November 2015. ^ "Paris Attacks". ABC News. ^ Brown, Mike. "What Is TATP? Paris Attackers Used Unstable Hydrogen Peroxide-Based Explosive For Detonations". International Business Times. Retrieved 20 November 2015. ^ "Attaques à Paris : le point sur l'enquête et le déroulé des attaques". Le Monde. 15 November 2015. Retrieved 15 November 2015. ^ a b "Attentats de Paris: le point sur l'enquête 24 heures après les faits". Le Figaro. 14 November 2015. Retrieved 15 November 2015. ^ a b "Paris shootings: Casualties in city centre and explosion at the Stade de France". BBC News. 13 November 2015. Retrieved 13 November 2015. ^ Alter, Charlotte (13 November 2015). "Dozens Feared Dead in Night of Violence in Paris". Time. Retrieved 13 November 2015. ^ a b Robinson, Joshua; Landauro, Inti (15 November 2015). "Paris Attacks: Suicide Bomber Was Blocked From Entering Stade de France". The Wall Street Journal. Retrieved 16 November 2015. ^ "How attacks in Paris unfolded". CNN. ^ a b Meichtry, Stacy; Robinson, Joshua; Kostov, Nick (15 November 2015). "Behind François Hollande's snap decision at Stade de France and the unfolding terror in Paris". The Wall Street Journal. Retrieved 18 November 2015. ^ "Paris terror attacks: Everything we know so far on Sunday morning". The Daily Telegraph. ^ "Quick thinking may have averted massacre at Paris stadium". Yahoo news. 16 November 2015. ^ a b c d e f g Rawlinson, Kevin (13 November 2015). "Fatal shootings and explosion reported in Paris – live". The Guardian. Archived from the original on 14 November 2015. Retrieved 13 November 2015. ^ a b c d Nossiter, Adam; Gladstone, Rick (13 November 2015). "Paris Attacks Kill More Than 100, Police Say; Border Controls Tightened". The New York Times. Retrieved 13 November 2015. ^ a b c d "At Least 35 Dead, More Than 100 Hostages Taken in Multiple Paris Attacks". Haaretz. 13 November 2015. Retrieved 13 November 2015. ^ Sam Borden (14 November 2015). "As Paris Attacks Unfolded, Players and Fans at Soccer Stadium Remained Unaware". The New York Times. Retrieved 14 November 2015. ^ Hills, David (14 November 2015). "France players praised for staying with Germany team in Stade de France". The Guardian. Retrieved 15 November 2015. ^ Stanglin, Doug (13 November 2015). "At least 46 dead in attacks in central Paris". USA Today. Retrieved 13 November 2015. ^ "Attaques à Paris : le point sur l'enquête et le déroulé des attaques". Le Monde.fr (in French). ISSN 1950-6244. Retrieved 19 November 2015. ^ a b c d "'It's a horror': Hollande orders French borders closed after Paris terror attack leaves at least 149 dead". National Post. 13 November 2015. Retrieved 14 November 2015. ^ a b Le Monde, Editors (14 November 2015). "Rue Bichat :"On pensait que c'étaient des pétards. C'étaient des scènes de guerre "". Le Monde. Retrieved 14 November 2015. ^ "Paris Attack Witness". The Guardian. Retrieved 19 November 2015. ^ a b c "Paris attacks: What we know". BBC News. Retrieved 19 November 2015. ^ "A Nation, le kamikaze s'est fait sauter en passant la commande". L'Express. 14 November 2015. Retrieved 19 November 2015. ^ a b c "What happened at the Bataclan?". BBC News. 18 November 2015. ^ a b c d e Nossiter, Adam; Higgins, Andrew (13 November 2015). "'Scene of Carnage' Inside Sold-Out Paris Concert Hall". The New York Times. Retrieved 14 November 2015. ^ a b c d e "Paris attacks updates". BBC News. 13–14 November 2015. ^ Andrew Higgins & Milan Schreuer (14 November 2015). "France Confronts 'Absolute Barbarity'". The New York Times. Retrieved 14 November 2015. ^ Nyheter, SVT. "Den svenske terroristen". SVT Nyheter (in Swedish). Retrieved 5 July 2017. ^ "Singer for Eagles of Death Metal escapes Paris attack". Los Angeles: abc7.com. 13 November 2015. Retrieved 13 November 2015. ^ Nossiter, Adam (13 November 2015). "Survivors of Hostage Siege Taken to Hospitals or Police Station". The New York Times. Paris, France. Retrieved 13 November 2015. [O]ne of them shouted, "What you are doing in Syria, you are going to pay for it now!" ^ Higgins, Andrew (13 November 2015). "This Is Because of all the Harm Done by Hollande to Muslims". The New York Times. Retrieved 13 November 2015. ^ "Paris shooting: Several killed and injured after 'Kalashnikov and grenade attacks' across French capital". The Daily Telegraph. Archived from the original on 13 November 2015. Retrieved 13 November 2015. ^ a b "Attentat à Paris: Le récit du sauvetage des otages au Bataclan par la BRI". 20 Minutes. Retrieved 19 November 2015. ^ "Comment la BRI a mené l'assaut au Bataclan". francetv info (in French). Retrieved 19 November 2015. ^ "Attaques terroristes à Paris: des dizaines de morts, l'état d'urgence décrété". Le Figaro. Selon plusieurs sources concordantes, l'assaut est terminé au Bataclan. Selon BFM-TV, deux terroristes auraient été tués. ^ Fansten, Emmanuel; Le Devin, Willy (14 November 2015). "Attentats: le pire des scénarios". Libération. Retrieved 19 November 2015. ^ Love, Brian; Labbe, Chine (17 November 2015). Callus, Andrew; King, Larry (eds.). "Factbox – Dead killers, hunted suspects after Paris attacks". Reuters. Archived from the original on 17 November 2015. Retrieved 17 November 2015. list of some of the seven attackers who died [...] Ismail Omar Mostefai, 29 (born Nov. 21, 1985), Frenchman of Algerian descent involved in Bataclan concert hall attack [...] Samy Amimour, 28 (born Oct. 15, 1987), involved in Bataclan attack. French, from Drancy, Saint Denis, north of Paris [...] Brahim Abdeslam, 31 (born July 30, 1984),[...] French, resident of Belgium. Blew himself up at Comptoir Voltaire café in Paris. [...] Bilal Hadfi, 20 (born Jan 22, 1995). Involved in Stade de France attack. [...] Suicide bomber involved in Stade de France attack. Passport found beside dead body of kamikaze bomber carries name of Ahmad Al Mohammad, 25, (born Sept. 10 1990), from Idlib, northwest Syria. ^ "Attentats à Paris: Le groupe Etat islamique revendique les attaques de vendredi à Paris". 20 Minutes (in French). Retrieved 14 November 2015. ^ "L'Etat islamique revendique les attentats de vendredi à Paris". liberation.fr (in French). Retrieved 14 November 2015. ^ Max Fisher. "Here is ISIS's statement claiming responsibility for the Paris attacks". Vox. ^ "Waleed Aly hits out at ISIS over Paris attacks, calls them weak". The Project. Retrieved 16 November 2015. ^ "Paris attacks: Bloody atrocity signals shift in Isis strategy". Financial Times. 14 November 2015. Retrieved 14 November 2015. ^ "This is because of all the harm done by Hollande to Muslims". The New York Times. 13 November 2015. ^ Ragan, Steve. "After Paris, ISIS moves propaganda machine to Darknet". CSO Online. Retrieved 17 November 2015. ^ "The First Official Da'esh DARKNET Bulletin Board Has Arrived". Krypt3ia.wordpress.com. 13 November 2015. Retrieved 17 November 2015. ^ P. Cruickshank –  published by CNN, 4 December 2015, retrieved 4 December 2015. ^ "Paris concert gunman was French, known to have Islamist ties – source". Reuters. 14 November 2015. Retrieved 14 November 2015. ^ "Passport of Egyptian man belongs to victim, not attacker, officials say". The Times of Israel. Retrieved 15 November 2015. ^ Aurelien Breeden, Kimiko de Freytas-Tamura and Katrin Bennhold (16 November 2015). "Hollande Calls for New Powers to 'Eradicate' ISIS After Paris Attacks". The New York Times. Retrieved 16 November 2015. ^ Aurelien Breeden; Katrin Bennhold & Kimiko de Freytas-Tamura (17 November 2015). "Paris Attacks Suspect Was Target of Strikes on ISIS in Syria". The New York Times. Retrieved 17 November 2015. ^ Halliday, Josh; Bucks, Jonathan (18 November 2015). "Abdelhamid Abaaoud: what we know about the Paris attacks 'mastermind'". The Guardian. The Guardian. Retrieved 20 November 2015. ^ a b Anthony Faiola, Missy Ryan & Souad Mekhennet (18 November 2015). "Suspected architect of Paris attacks is dead, according to two senior intelligence officials". The Washington Post. Retrieved 18 November 2015. ^ a b Anthony Faiola, Missy Ryan & Daniela Deane (18 November 2015). "Suspected architect of Paris attacks is dead, according to two senior intelligence officials". MSN. Archived from the original on 19 November 2015. Retrieved 18 November 2015. ^ a b Reguly, Eric (19 November 2015). "Two dead, eight arrested after police raid Paris apartment in hunt for suspects". The Globe and Mail. Toronto, Canada. Retrieved 19 November 2015. ^ a b "How the planners of the 2015 Paris attacks were systematically eliminated - France 24". France 24. 9 November 2018. Retrieved 10 November 2018. ^ "A discarded parking ticket in a car near the Bataclan leads detectives to Brussels". The Guardian. 15 November 2015. Retrieved 15 November 2015. ^ "Attentats à Paris: La police lance un appel à témoins" [Bombings in Paris: Police have appealed for witnesses]. 20 Minutes (in French). 15 November 2015. Retrieved 25 November 2015. ^ "Prosecutor: 3 Paris attack suspects already known to Belgians". CNN. 17 November 2015. ^ "Paris attacks: Latest updates". BBC News. Retrieved 17 November 2015. ^ "French officials: Manhunt in Europe for at least one suspect 'directly involved' in Paris attacks". The Washington Post. 15 November 2015. Retrieved 16 November 2015. ^ "Brussels raids: Paris attack suspect Abdeslam 'arrested'". BBC World Service. 18 March 2016. Retrieved 18 March 2016. ^ Aurelien Breeden & Michael Nossiter (15 November 2015). "Manhunt Underway as Investigation of Paris Attacks Widens". The New York Times. Retrieved 15 November 2015. ^ Doug Bolton (16 November 2015). "Salah Abdeslam's brother denies involvement in Paris attacks and says he has no idea where his brother is". The Independent. Retrieved 16 November 2015. ^ "Paris terror attacks: vigils held around the world as Parisians remain on edge – live updates". The Guardian. 14 November 2015. Retrieved 14 November 2015. ^ "Bavaria arrest raises suspicions about links to Paris attacks". DW.COM. Retrieved 14 November 2015. ^ "Terror in Paris: What we know so far". CNN. Retrieved 16 November 2015. ^ "Paris attacks: France mobilises 115,000 security personnel". BBC News. 17 November 2015. ^ Thomas, Leigh; Bon, Gerard (21 November 2015). "Tapped phone led Paris attack leader to his death". Reuters UK. Thomson Reuters. Retrieved 21 November 2015. ^ Samuel Osborne (20 November 2015). "Hasna Ait Boulahcen – Europe's first female suicide bomber – 'did not blow herself up'". The Independent. Retrieved 21 November 2015. ^ "Hasna Aitboulahcen est morte dans l'assaut, mais elle n'était pas kamikaze" [Hasna Aitboulahcen died in the assault, but she was not a kamikaze]. lexpress.fr (in French). 20 November 2015. Retrieved 25 November 2015. ^ "France finds explosive belt, detects Paris suspect's phone". Reuters. 23 November 2015. Retrieved 23 November 2015. ^ "Hollande and Obama to intensify anti-IS push". BBC News. 24 November 2015. Retrieved 24 November 2015. ^ a b "Paris attacks: 'Key suspect Abrini' arrested". BBC News. Retrieved 8 April 2016. ^ Faiola, Anthony; Mekhennet, Souad (21 April 2016). "Tracing the path of four terrorists sent to Europe by the Islamic State". The Washington Post. Retrieved 5 September 2016. ^ a b c Samuel, Henry (5 September 2016). "Mystery member of Paris attacks cell only captured in July despite posting on Facebook from Belgium". The Daily Telegraph. Retrieved 5 September 2016. ^ "Fabien Clain, la voix de l'État islamique" [Fabien Clain, the voice of the Islamic State]. MSN (in French). Archived from the original on 4 March 2016. ^ Emeline Cazi; Adrien Pécout (24 November 2015). "Jawad Bendaoud, a well known "landlord" in the streets of Saint-Denis". Le Monde (in French). Retrieved 11 September 2017. Since his arrest on Wednesday, November 18, Jawad Bendaoud insists that he did not know the identity of his three recent "tenants" of 8, rue du Corbillon: Abdelhamid Abaaoud, the alleged instigator of the attacks of November 13, his cousin Hasna Aït Boulahcen, as well as a third man with an unknown identity. All killed during the RAID assault. ^ "Attentats à Paris: le "logeur" des djihadistes du 13 novembre 2015 échappe aux assises". RTBF (in French). 8 September 2018. Retrieved 11 September 2017. In their order signed Wednesday, the investigating magistrates ordered that Jawad Bendaoud be tried for " concealment of terrorist criminals ", said the source, a crime punishable by a six-year prison sentence as he is in a state of recidivism . ^ Engel, Richard; Schuppe, Jon. "Responsibility For Paris Terror Attacks Remains Unclear". NBC News. Retrieved 14 November 2015. ^ Riedel, Bruce. "Modeled on Mumbai? Why the 2008 India attack is the best way to understand Paris". Brookings. Retrieved 15 November 2015. ^ Mehta, Nalin (15 November 2015). "What we can learn from Paris". The Times of India. Retrieved 15 November 2015. ^ Hafeez, Mateen (15 November 2015). "Why the 26/11 Mumbai strike and Paris attacks are similar". The Times of India. Retrieved 16 November 2015. ^ Gupta, Saurabh (14 November 2015). "In Paris, Investigators See a Rerun of Mumbai Tragedy". NDTV. Retrieved 16 November 2015. ^ Sen, Shawan (14 November 2015). "There is similarity between Mumbai 26/11 and Paris attacks: Mumbai Police". CNN-IBN. Retrieved 16 November 2015. ^ Tabassum Barnagarwala; Rashmi Rajput (15 November 2015). "Paris: In multiple attacks, targets, the timing, Mumbai victims, investigators see 26/11". The Indian Express. Retrieved 16 November 2015. ^ "Signs Point to Unencrypted Communications Between Terror Suspects". The Intercept. 18 November 2015. Retrieved 18 November 2015. ^ "Le mémorial du " Monde " aux victimes des attentats du 13-Novembre". Le Monde. ^ a b c James, Mike (14 November 2015). "Names, nationalities of the dead emerge from Paris terror". USA Today. ^ "El hijo de una pareja de Granada es el tercer español fallecido en los ataques". El País (in Spanish). 17 November 2015. Retrieved 17 November 2015. ^ "Two Egyptians Killed, One Severely Injured in Paris Attacks". Egyptian Streets. Retrieved 17 November 2015. ^ "Elif Dogan et Milko Jozic, deux Liégeois, ont perdu la vie dans les attentats de Paris" [Elif Dogan and Milko Jozic, two people from Liège, lost their lives in the Paris attacks]. La Meuse (in French). Copiepresse. 14 November 2015. Retrieved 14 November 2015. ^ "KUNA : Algeria confirms two nat'ls among Paris attack victims". kuna.net.kw. 14 November 2015. Retrieved 14 November 2015. ^ Ait Abdellah, S. (11 November 2015). "Sebaa Djalal-Eddine, troisième victime algérienne des attentats de Paris" (in French). Ennahar. Archived from the original on 30 November 2015. Retrieved 15 December 2015. ^ Bozonnet, Charlotte. "Djalal Sebaa, 31 ans" (in French). Le Monde. Retrieved 15 December 2015. ^ "Paris: Two Portuguese killed in terror attacks – Portugal". The Portuguese American Journal. 14 November 2015. ^ "Ein Deutscher bei Attentaten von Paris getötet". Retrieved 19 November 2015. ^ "Anschläge in Paris: Zweites deutsches Todesopfer bestätigt". Retrieved 19 November 2015. ^ a b c d "Paris attacks: Who were the victims?". BBC News. 19 November 2015. ^ "Armenian teen among casualties of Paris attacks". News.am. ^ Agnese Ananasso. "Strage Parigi, i parenti: Valeria Solesin tra le vittime del teatro Bataclan". la Repubblica. ^ "Parigi, tra i feriti due italiani di Senigallia – l'Espresso". la Repubblica. Retrieved 16 November 2015. ^ a b The New York Times (20 November 2015). "Paris Victims, Remembered". The New York Times. Retrieved 18 July 2017. ^ Harress, Christopher (14 November 2015). "How Many People Died in Paris Shooting? Update on Mass Attacks in French Capital". International Business Times. ^ "Trauma medicine has learned lessons from the battlefield". The Economist. 12 October 2017. ^ "Paris attacks latest". The Telegraph. Retrieved 15 November 2015. ^ "Guillaume B. Decherf a été tué hier au Bataclan" [Guillaume B. Decherf was killed yesterday at the Bataclan]. Les Inrockuptibles (in French). 14 November 2015. Retrieved 14 November 2015. ^ "Nette augmentation des passages aux Urgences pour stress en Ile-de-France" (in French). Francetvinfo.fr. 20 November 2015. Retrieved 22 November 2015. ^ Caitlin Hu. "ISIL supporters already have a hashtag for the bloody Paris attacks". Quartz. ^ "Attacks in Paris: Live Updates From France". The New York Times. 14 November 2015. Retrieved 15 November 2015. ^ "Paris Attacks: Mom, Daughter Pay Tribute to Victims, Make Sense of Terror". NBC News. 15 November 2015. Retrieved 15 November 2015. ^ Fisher, David (14 November 2015). "France's Muslims strongly condemn Paris attacks". Archived from the original on 29 November 2015. ^ "Attentats de Paris : les fédérations musulmanes dénoncent "une barbarie abjecte"". RTL. Retrieved 15 November 2015. ^ "Après les attentats à Paris, les musulmans appelés à réagir". Les Échos. Retrieved 15 November 2015. ^ Celestine Bohlen (15 November 2015). "Parisians Fear Terror Attacks Will Divide, Not Unite, the City". The New York Times. Retrieved 15 November 2015. ^ Adam Nossiter & Liz Alderman (16 November 2015). "After Paris Attacks, a Darker Mood Toward Islam Emerges in France". The New York Times. Retrieved 16 November 2015. ^ a b Liz Alderman (26 November 2015). "Paris Attacks Have Many in France Eager to Join the Fight". The New York Times. Retrieved 26 November 2015. ^ Chappell, Bill (4 December 2015). "Cafe That Was Hit By Paris Terrorism Attack Reopens". NPR.org. ^ "President Hollande: France will overcome the terrorists". CNN. 13 November 2015. Retrieved 14 November 2015. ^ Sharma, Swati (13 November 2015). "'It is horror': French President Hollande's remarks after Paris attacks". The Washington Post. Retrieved 14 November 2015. ^ "Hollande cancels trip to Turkey for G20 after attacks: presidency". Yahoo! News. Agence France-Presse. 13 November 2015. Retrieved 13 November 2015. ^ "Attentats: Hollande décrète "trois jours de deuil national"". Europe 1. Retrieved 14 November 2015. ^ "'France is at war': Hollande urges more security spending & stripping of citizenship after attacks". RT English. Retrieved 17 November 2015. ^ Reuters (4 December 2015). "France publishes guide on how to survive a terrorist attack". www.theglobeandmail.com. The Globe and Mail. Archived from the original on 8 December 2015. Retrieved 4 December 2015. ^ Love, Brian; Callus, Andrew (4 December 2015). "France issues guide to surviving terrorist attack". www.reuters.com. Reuters. Retrieved 4 December 2015. ^ "Une vingtaine de mosquées fermées depuis décembre, annonce Cazeneuve". Le Figaro. 1 August 2016. Retrieved 16 March 2017. ^ "French jets bomb ISIS stronghold of Raqqa". CNN. 16 November 2015. Retrieved 17 November 2015. ^ "Le porte-avions " Charles-de-Gaulle " a appareillé en direction de la Méditerranée orientale" [Aircraft Carrier "Charles de Gaulle" Heading Towards Eastern Mediterranean]. lemonde.fr. 18 November 2015. Retrieved 23 November 2015. ^ Floc'h, Benoît (20 November 2015). "Au centre de recrutement des armées :" Ce coup-là, c'est bon, je m'engage "". Le Monde. Retrieved 20 November 2015. ^ Willsher, Kim (14 November 2015). "Front National has chance to take centre stage after Paris attacks". The Guardian. Retrieved 16 November 2015. ^ "Minute de silence à la Sorbonne en présence du président Hollande". Le Monde.fr. ^ Potter, Mitch (18 November 2015). "Hollande promises France will remain a country of freedom". Toronto Star. Toronto, Canada. Retrieved 20 November 2015. ^ Ishaan Tharoor (18 November 2015). "France says it will take 30,000 Syrian refugees, while U.S. Republicans would turn them away". The Washington Post. ^ Mayer, Lisa (27 November 2015). "France's National Front leader calls Canada's refugee plan 'madness'". CBC News. CBC/Radio Canada. Retrieved 1 December 2015. ^ Vivdon-White, Maya (26 November 2015). "France's far-right party surges on immigration, terror fears". Washington Times. Washington, DC, USA. Retrieved 1 December 2015. ^ "PM disappointed at Juncker's words about migration". The Prague Post. 15 November 2015. Retrieved 21 November 2015. ^ "Paris attacks: Latest updates – BBC News". www.bbc.com. Retrieved 17 November 2015. ^ "PM: UK Should Join France In Syria Strikes". Sky News. ^ "German parliament gives green light to air missions in Syria". euronews. Retrieved 4 December 2015. ^ "Germany to send up to 650 soldiers to Mali". dw.com. ^ Rick Lyman & Alison Smale (15 November 2015). "Paris Attacks Shift Europe's Migrant Focus to Security". The New York Times. Retrieved 16 November 2015. ^ Bloomberg and Associated Press (19 November 2015). "Paris attacks suspected mastermind killed in Saint-Denis raids". TheStar.com World. Toronto Star. Retrieved 19 November 2015. ^ "EU agrees to tighten border checks". Sky News. 20 November 2015. Retrieved 20 November 2015. ^ "Poland says it cannot accept migrants under EU quotas, following attacks in Paris". The Independent. 14 November 2015. Retrieved 14 November 2015. ^ "Poland says cannot take migrants under EU quotas without guarantees after Paris attacks". Reuters. 14 November 2015. Retrieved 14 November 2015. ^ Agence France-Press (16 November 2015). "Poland's new right-wing government takes hard line on migrants". Global Post. Global Post. Retrieved 22 November 2015. ^ Agence France-Press (18 November 2015). "Polish PM slams EU policy as 'export of migrant problem'". Channel NewsAsia. MediaCorp Pte Ltd. Retrieved 22 November 2015. ^ Maurice, Eric (19 November 2015). "France confirms it will receive 30,000 refugees". EUobserver. EUobserver. Retrieved 20 November 2015. ^ Lopatka, Jan; Muller, Robert (20 November 2015). "Czech PM rebukes president for supporting anti-Islamic groups: paper". Reuters U.S. Reuters Thomson. Retrieved 20 November 2015. ^ "U.S. reacts to Paris attacks; officials unaware of prior 'chatter'". Winston-Salem Journal. Associated Press. Retrieved 14 November 2015. ^ Murphy, Jack. "Breaking: French and German Police Knew Paris Attack Was Coming a Month Prior". SOFREP.com. Retrieved 14 November 2015. ^ "Man Arrested in Germany With Weapons in Car May Have Links To Paris Attacks". The Huffington Post. Associated Press. Retrieved 14 November 2015. ^ Higgins, Andrew; DE FREYTAS-TAMURA, KIMIKO; BENNHOLDNOV, KATRIN. "In Suspects' Brussels Neighborhood, a History of Petty Crimes and Missed Chances". The New York Times. Retrieved 17 November 2015. ^ Chan, Sewell; Schreuer, Milan (26 December 2015). "School's Warnings About Paris Attacker Were Not Passed On". The New York Times. ISSN 0362-4331. Retrieved 26 December 2015. ^ "Live updates: Attacks in Paris". The Washington Post. 13 November 2015. Retrieved 13 November 2015. ^ "Paris déploie son " plan multi-attentats "". Radio Canada. Canadian Broadcasting Corporation. Retrieved 13 November 2015. ^ "Attaques simultanées à Paris: La Préfecture demande aux gens de "rester chez eux"". 20 Minutes. Retrieved 13 November 2015. ^ "Attaques à Paris : "Plan blanc" d'urgence et de crise à l'AP-HP". Europe 1. Retrieved 13 November 2015. ^ "American Airlines delays Paris flights". Reuters. 13 November 2015. Retrieved 14 November 2015. ^ A-J.C. avec AFP. "Attaques à Paris : cinq lignes de métro coupées". europe1.fr. Retrieved 14 November 2015. ^ Megan Willett (13 November 2015). "Parisians Take to Twitter to Figure Out Transportation After Paris Attacks". Tech Insider. Retrieved 13 November 2015. ^ a b c d e Victoria Shannon (14 November 2015). "Paris Attacks: What We Know and Don't Know". The New York Times. Retrieved 14 November 2015. ^ "Sporting events in Paris called off in wake of terror attacks". Sky Sports. ^ "ISU Grand Prix of Figure Skating Event in Bordeaux France cancelled". International Skating Union. 14 November 2015. Archived from the original on 16 November 2015. Retrieved 14 November 2015. ^ Keslassy, Elsa (14 November 2015). "Disneyland Paris Closed in the Wake of Terrorist Attack". Variety. Retrieved 14 November 2015. ^ "Eiffel Tower reopens, lit in blue, white, red". USA Today. 16 November 2015. ^ "Paris attacks: Gigs cancelled as bands pay respects". BBC News. 15 November 2015. Retrieved 15 November 2015. ^ a b Ritter, Karl; Cook, Lorne (20 November 2015). "Death toll rises to 130 following Paris attacks". Toronto Star. Toronto, Canada. Retrieved 21 November 2015. ^ (in Dutch) 'Frankrijk trekt onvoldoende lering uit de aanslagen' ('France learns not enough from the attacks'). NRC Handelsblad, 12 May 2016. Retrieved 19 November 2016. François Heisbourg is cited as saying: "The state of emergency has now been extended twice, the last time until end of July 2016". ^ a b "Brussels in lockdown after terror threat level is raised to maximum". The Guardian. 21 November 2015. Retrieved 21 November 2015. ^ a b "Brussels shutdown as manhunt for Paris fugitive Abdeslam continues". BBC News. 21 November 2015. Retrieved 21 November 2015. ^ "Paris attacks: Brussels on high alert". BBC News. 21 November 2015. Retrieved 21 November 2015. ^ a b Higgins, Andrew; de Freytas-Tamura, Kimiko (21 November 2015). "Brussels Placed at Highest Alert Level; Subway Is Closed". The New York Times. Retrieved 21 November 2015. ^ a b Jamieson, Alastair; Winter, Tom; Akyavas, Aziz; Lavanga, Claudio (21 November 2015). "Brussels on Terror Lockdown Amid Threat of Paris-Style Attack". NBC News. Retrieved 21 November 2015. ^ Benjamin Mueller & Michael S. Schmidt (14 November 2015). "Day After Paris Attacks, Familiar Fear Grips a Wary New York". The New York Times. Retrieved 14 November 2015. ^ "Cities in U.S. Increase Security After Paris Attacks". NBC News. Retrieved 14 November 2015. ^ J. David Goodman (15 November 2015). "New York City Police Commissioner Says Attacks Will Force Changes in Tactics". The New York Times. Retrieved 15 November 2015. ^ "Singapore raises alert level following Paris attacks: Shanmugam". Channel NewsAsia. Retrieved 14 November 2015. ^ Calica, Aurea (15 November 2015). "Noy vows highest security for APEC". The Philippine Star. Retrieved 15 November 2015. "Turnbull condemns 'brutal' terror attacks". ABC News. Retrieved 14 November 2015. "Sri Lankan leaders offer 'prayers and thoughts' over Paris attacks". ColomboPage. 14 November 2015. Retrieved 14 November 2015. "France : l'ONU condamne les attaques terroristes à Paris". Centre d'actualités de l'ONU (in French). 13 November 2015. Retrieved 14 November 2015. Gander, Kashmira (14 November 2015). "Paris attacks: David Cameron 'shocked' after over 100 killed in French capital". The Independent. Retrieved 14 November 2015. "Paris attacks: Justin Trudeau says terrorist attacks 'deeply worrying'". CBCNews. Retrieved 14 November 2015. "Paris attacks: China's President Xi Jinping says he's willing to join France in combating terrorism". The Straits Times. Retrieved 14 November 2015. "Chinese premier strongly condemns Paris terror attacks". Xinhua News Agency. Retrieved 14 November 2015. Narendra Modi [@narendramodi] (13 November 2015). "News from Paris is anguishing & dreadful. Prayers with families of the deceased. We are united with people of France in this tragic hour" (Tweet) – via Twitter. "World Leaders Express Shock, Sadness at Paris Attacks". NBC News. Retrieved 14 November 2015. Sabillo, Kristine Angeli (14 November 2015). "Aquino: 'We stand with France now'". Philippine Daily Inquirer. Retrieved 14 November 2015. "Russia condemns 'hateful' attacks in Paris, ready to help investigation". Yahoo News. Retrieved 14 November 2015. Ndonga, Simon. "Uhuru says Kenya stands with Paris in extremism war". Capital FM News. Capital FM Kenya. Retrieved 14 November 2015. ^ "Wales joins minute's silence for victims". BBC News. 16 November 2015. Retrieved 16 November 2015. ^ "Minute's silence in UK to remember the 132 victims". City AM. 16 November 2015. Retrieved 16 November 2015. ^ "US House votes to suspend Syria refugee program". Yahoo News. 19 November 2015. ^ "More than half the nation's governors say Syrian refugees not welcome". CNN. 19 November 2015. ^ Rose Troup Buchanan (14 November 2015). "Paris terror: Muslim leaders around the world condemn 'heinous' attacks". The Independent. Retrieved 13 November 2016. ^ "Arab states condemn 'terrorist' Paris attacks". Al Arabiya. 14 November 2015. ^ "Paris attacks 'crimes against humanity': Iran president". Yahoo News. 14 November 2015. ^ "Head of Ahmadiyya Muslim Community condemns Paris attacks and prays for victims". Khalifa of Islam. ^ "France suffers from savage terror as Syrian people have been: Assad". Xinhua News Agency. 14 November 2015. ^ Hugh Naylor (14 November 2015). "Syria's President Assad says Paris attacks result from France's aiding of rebels". The Washington Post. ^ a b "Syria's Nusra Front backs Paris attacks, despite opposition to Islamic State". Middle East Eye. ^ "Hezbollah chief denounces Paris attacks". Agence France-Presse. 14 November 2015. ^ "Hamas, Hezbollah, Islamic Jihad denounce Paris attacks". DW.COM. ^ a b "Bomb threat leads to cancellation of Germany-Netherlands 'freedom' football friendly". ABC News. 17 November 2015. ^ a b c d "'Five bombings planned' in Germany according to French intelligence dossier". The Telegraph. 20 November 2015. ^ a b c "Germany vs Netherlands match in Hannover cancelled following 'concrete threat made with plans for explosion'". The Independent. 17 November 2015. ^ a b c "'Ambulance Truck Bomb' Scare at Hannover Stadium: 5 Fast Facts You Need to Know". Heavy.com. 17 November 2015. ^ "'Serious plans for explosions' cancel Netherlands-Germany soccer match". CNN. 17 November 2015. ^ "Gunfire in Brussels after 'police raid on suspected terrorists'". The Independent. 15 March 2016. Retrieved 15 March 2016. ^ Reuters (15 March 2016). "Belgian police hunt gunman after Brussels anti-terror raid". The Guardian. ISSN 0261-3077. Retrieved 15 March 2016. ^ "Gunshots & smoke reported amid Brussels raid, 1 fatality feared". Russia Today. 18 March 2016. Retrieved 18 March 2016. ^ "Fred Dewilde". Lambiek.net. Retrieved 27 November 2018. ^ Leicester, John (21 October 2016). "New graphic novel recounts Bataclan horror". The Times of Israel. Retrieved 27 November 2018. ^ "Mon Bataclan: le récit bouleversant d'un rescapé en bande dessinée". Lefigaro.fr. Retrieved 27 November 2018. This page was last edited on 20 April 2019, at 06:42 (UTC).